Che Guevara: «I came to communism because of Stalin». Ernesto Che Guevara is undoubtedly a historical figure of the 20th century’s communist movement who attracts the interest of people from a vast range of political ideologies. The years followed his cowardly assassination in Bolivia, Che became a revolutionary symbol for a variety of marxist-oriented, leftist and progressive parties and organisations- from Trotskyists to militant leninists and from Social Democrats to anarcho-libertarians. A significant number of those who admire the argentine revolutionary identify themselves as “anti-stalinists”, hate and curse Stalin while they often refer to the so-called “crimes” of Stalin’s era. What is a contradiction and an irony of history is the following: Che Guevara himself was an admirer of Joseph Stalin. On the occasion of the 63 years since the death of the great Soviet leader, let us remember what Che thought about Joseph Stalin, taking into account Guevara’s own writings and letters. In 1953, situated in Guatemala, the 25 years old then Che noted in his letter to aunt Beatriz: “Along the way, I had the opportunity to pass through the dominions of the United Fruit, convincing me once again of just how terrible these capitalist octopuses are. I have sworn before a picture of the old and mourned comrade Stalin that I won’t rest until I see these capitalist octopuses annihilated” (Jon Lee Anderson, Che Guevara: A Revolutionary Life, 1997). While praising Stalin’s leadership, Che was always pointing out the counter-revolutionary role of Trotsky, blaming him for “hidden motives” and “fundamental errors”. In one of his writings he was underlining: “I think that the fundamental stuff that Trotsky was based upon was erroneous and that his ulterior behaviour was wrong and his last years were even dark. The Trotskyites have not contributed anything whatsoever to the revolutionary movement; where they did most was in Peru, but they finally failed there because their methods are bad” (Comments on ‘Critical Notes on Political Economy’ by Che Guevara, Revolutionary Democracy Journal, 2007). “In Cuba there is nothing published, if one excludes the Soviet bricks, which bring the inconvenience that they do not let you think; the party did it for you and you should digest it. It would be necessary to publish the complete works of Marx, Engels, Lenin, Stalin [underlined by Che in the original] and other great Marxists. Here would come to the great revisionists (if you want you can add here Khrushchev), well analyzed, more profoundly than any others and also your friend Trotsky, who existed and apparently wrote something” (Contracorriente, No.9, Sept.1997). The revisionist route that the Soviet leadership followed after the CPSU 20th Congress became a source of intense concern for Che. The policy of the so-called “De-Stalinization” and the erroneous, opportunist perceptions about the process of building socialism that the Khrushchev leadership introduced after 1956 had their own critical impact on Guevara’s view on Revolution and Socialism. One of Guevara’s biographers, the Mexican politician Jorge Castañeda wrote (adding an anti-communist flavor): “Guevara became a Stalinist at a time when thousands were becoming disillusioned with official “Communism”. 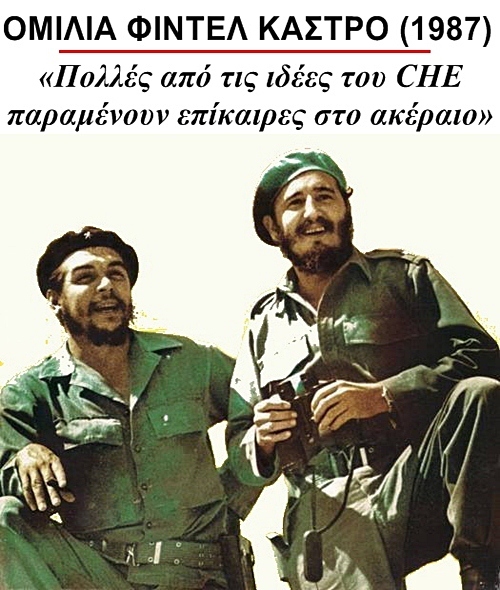 He rejected Khrushchev’s speech in 1956 denouncing the crimes of Stalin as “imperialist propaganda” and defended the Russian invasion of Hungary that crushed the workers’ uprising there in the same year” (J. Castañeda, Compañero: The Life and Death of Che Guevara, 1997). Four years after the beginning of Khrushchev’s “de-stalinization”, on November 1960, Ernesto Che Guevara was visiting Moscow as an official representative of the Cuban government. Against the advise of the then Cuban ambassador to avoid such an action, Che insisted on visiting and depositing a floral tribute at Stalin’s tomb at the Kremlin necropolis. Che had a deep admiration for the leader Joseph Stalin and his contribution in building Socialism. And that because, as Che himself was saying, “ You have to look at Stalin in the historical context in which he moves […] in that particular historical context”. That historical context and the extremely adverse and difficult social, economic and political environment in which Stalin led the Soviet Union are muted by the votaries of antistalinism. They hush up and deliberately ignore the fact that the process of building Socialism in the Soviet Union was taking place within a frame of fierce class-struggle, with numerous – internal and external (imperialist encirclement)- threats, while the massive effort of industrialization faced reactions and extensive sabotages (the collectivisation process, for example, faced the negative stance of Kulaks). Joseph Stalin, as a personality and leader, was the product of the action of the masses within a specific historical context. And it was Stalin who guided the Bolsheviks’ Party (AUCP-B) and the Soviet people for 30 years, based on Lenin’s solid ideological heritage. As a real communist, a true revolutionary- in theory and in practice- Ernesto Che Guevara would inevitably recognize and appreciate that historical reality. Δημοσιεύθηκε την Απρίλιος 12, 2016 Απρίλιος 12, 2016 από GuevaristasPosted in Ernesto Che GuevaraΜε ετικέτα Communism,Ernesto Che Guevara,Ideology,Joseph Stalin,Nikos Mottas,Socialism,Stalinism.